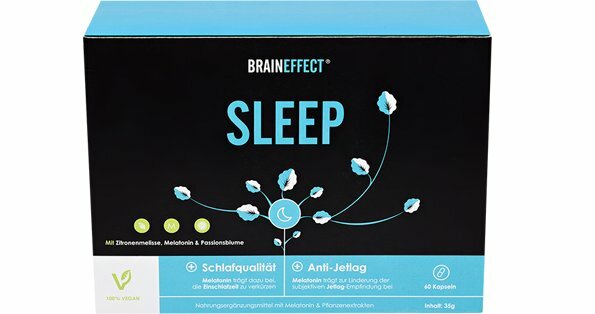 BrainEffect Sleep Melatonin Spray is a melatonin spray containing 0.125 mg of melatonin per dose. Perfect dosage, fast action. 30 mL per bottle for 30 doses of 1 mg melatonin. Melatonin is a natural sleep hormone that helps you fall asleep quickly in the evening. The body makes melatonin when it gets dark. During the day, bright light blocks the production of melatonin, so you are alert and awake. Nowadays there is so much artificial lighting in the evening that it is not always dark enough for the body to produce melatonin. Even the light from your telephone or laptop can cause you to produce less melatonin. Stress, exercise in the evening or jet lag can also prevent you from falling asleep quickly. A melatonin supplement can help to replenish your own melatonin production. 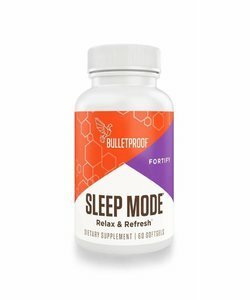 Why BrainEffect Sleep Melatonin Spray? Melatonin supplements are available in many forms and dosages, usually packaged as capsules or tablets. Melatonin from such supplements still needs to be digested and absorbed before you notice the effects, which can sometimes take up to an hour. Melatonin from the BrainEffect Sleep Melatonin Spray is absorbed directly from the mouth through the mucous membranes, so you only need to take it 20 minutes before bedtime. One spray dose contains 0.125 mg of melatonin, so you can adjust the dose according to your needs. The Sleep Melatonin Spray is packaged in a small, 30 mL bottle, making it ideal to take along on a trip. The spray has a fresh mint flavour and contains no sugar, so you can use it after brushing your teeth without affecting your dental health. BrainEffect Sleep Melatonin Spray contains no ingredients of animal origin and is therefore suitable for vegans. 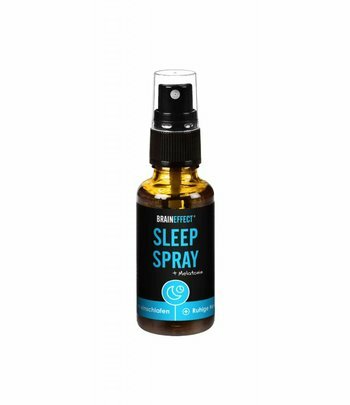 Spray the BrainEffect Sleep Melatonin Spray directly into your mouth. The recommended usage is to take 8 spray doses 20 minutes before going to bed. You can start with half a dose (4 sprays) or less and increase the dose as needed. 4 sprays contain 0.5 mg melatonin. 8 sprays contain 1.0 mg melatonin. Take at least 0.5 mg of melatonin shortly before bedtime on the first day of travel. Take at least 0.5 mg of melatonin shortly before bedtime at the destination for several days after arrival. You can also use the BrainEffect Sleep Melatonin Spray after brushing your teeth. It contains no sugar and has a fresh mint taste. One bottle of BrainEffect Sleep Melatonin Spray contains 30 mL, sufficient for 30 daily doses of 8 sprays. Additional ingredients: water, sweetener (sorbitol, glycerine), acidifier (citric acid), flavour (lemon, mint), preservatives (sodium benzoate, potassium sorbate). 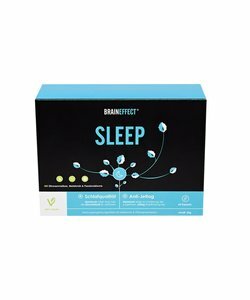 BrainEffect Sleep Melatonin Spray is a dietary supplement in the herbal preparation category and is no replacement for a healthy and balanced diet and/or lifestyle. For a consecutive period longer than 3 weeks. When using drugs that act on the brain.